Prior to the North German Confederation, German States stamps were issued by most of the separate Germanic kingdoms, duchies, free-cities, etc. of Northern Europe.. 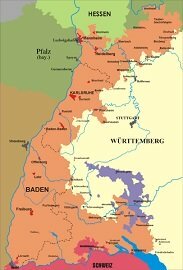 The State of Baden has existed since the 12th Century, but the Grand Duchy of Baden came into existence in 1806, following the dissolution of the Holy Roman Empire. It became a republic for a while in 1849, following the German uprisings of 1848, but Prussia intervened, and the Grand Duchy was restored. The last Grand Duke of Baden, Frederick I (1852-1907), was an ally of Prussia and helped to found the German Empire, which Baden joined in 1871. In 1918, following the end of World War I, Baden became part of the Weimar Republic, as the Republic of Baden. It is now part of the German state of Baden-Württemberg. The first German States stamps for the Grand Duchy of Baden appeared in May of 1851. The stamps were typographed, imperforate, and printed in black on pale buff, orange, blue green, and deep rose papers. They are shown in the first row in the scan above (Mi. #1a-4a, Sc. #1a-4a). The paler paper shades do not show up well in the scan above. Especially that of the 1 Kr. on pale buff paper. These stamps were again printed in August of 1851 on dark buff, yellow, yellow green, and lilac rose papers, continuing through the middle of 1852. These are shown in the second row of the scan above (Mi. #1b-4b, Sc. #1-4). In 1853, the 1 Kr. was printed in black on white paper, the 3 Kr. was printed in black on green paper, and the 6 Kr. was printed in black on yellow paper. In 1858, the 3 Kr. was printed in black on blue paper. The stamps are all shown in the scan above (Mi. #5-8, Sc. #6-9). In 1865, all the first issues were reprinted on thick paper, except for the 6 Kr. black on yellow, which was reprinted on thin paper. The reprints are worth far less than the originals. From 1860 to 1862, new designs with the Baden coat of arms were issued. They were all printed on white paper, with a lined background behind the arms. In 1860, they were all perforated 13 1/2 (Mi. #9-12, Sc. #10-14), and in 1862 they were perforated 10 (Mi. #13-15, Sc. #15-17). All of them, except for the perforated 10 1 Kr. denomination, are shown above. In 1862, a new design with a white background was issued (Mi. #16, Sc. #18). The 3 Kr. in rose on white paper, was initially issued with gauge 13 1/2 perforations. From 1862 to 1865 the new white background definitives were issued in six denominations, from the 1 Kr. through the 30 Kr., and they were all perforated 10. There are many different shades of color on these issues. The set is shown above (Mi. #17-22, Sc. #19-25). In 1868, the 1 Kr., in green, 3 Kr. in rose, and 7 Kr. in blue of the last design were issued. They featured the denomination in the tablet at the bottom abbreviated, instead of spelled out, as on prior issues. They are shown above (Mi. #23-25, Sc. #26-28). In 1862, a special set of stamps was issued to pay "Rural Postage Due". They were all printed in black on yellow paper, as shown above (Mi. Landpost #1-3, Sc. #LJ1-3). Used copies are rare, and fake cancellations abound. 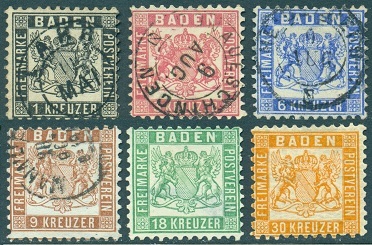 At the beginning of 1872, the German States stamps for the Grand Duchy of Baden were replaced by those of the German Empire.